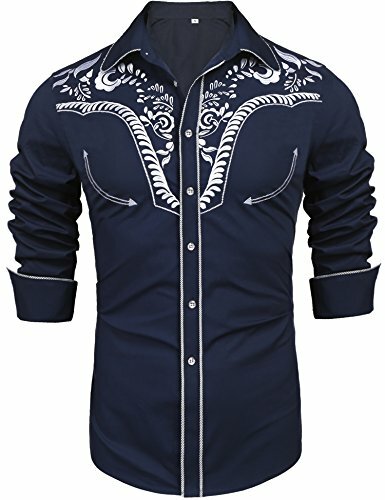 Classic retro styled western shirt for men. 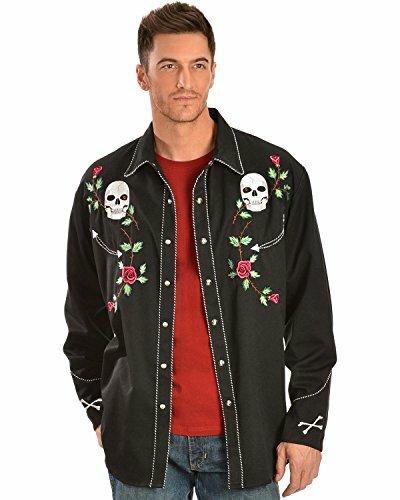 Featuring red roses embroidered onto a classic black western shirt with front and back yokes and snap closures. Poly/Cotton Blend. Import. Our vintage western style Scully Shirt boasts a cowboy fashion that is both easy and fun to wear Learn more about Scully shirts by clicking on Men's Scully Shirts. Scully western shirt has a comfortable spread collar. Two smile pockets complete with twisted piping and arrow design. Black pearlized, skull image inset snap closures at front placket and six-snap cuffs. Black and white twisted piping accents. Men's shirt is made of 65% polyester/35% rayon. Imported. This retro western shirt is perfect for casual, riding, and dress wear. Unique design features a retro floral leaf emroidery pattern on the front and 2 curved slit pockets. Pocket borders and collar are contrast colored. Convenient pearlized snap buttons with a trendy 3 button cuff. This comfortable, affordable, and stylish shirt is made of a poly-cotton blend and is available in a variety of colors and wide range of sizes. 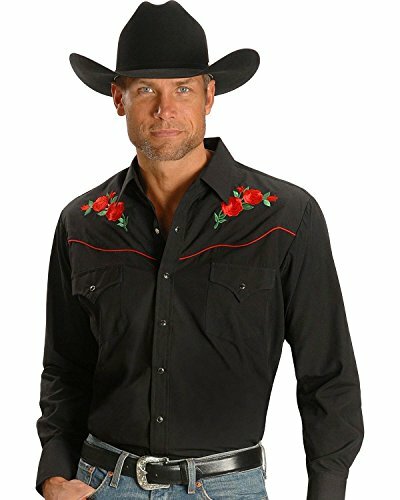 True western design complements every cowboy This rose and horseshoe embroidered Scully shirt features handsome embroidery at yokes. 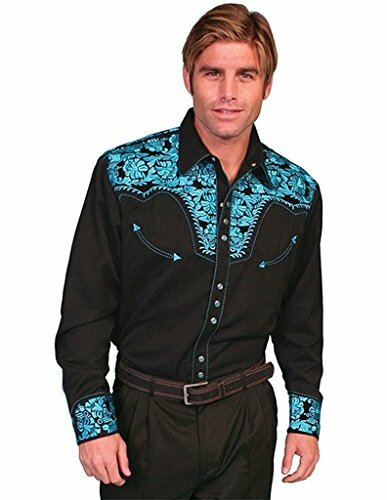 Shirt has two retro western smile pockets complete with arrow stitching. Pearlized snaps on decorative front placket and six-snap cuffs. Made of 65% polyester/35% rayon. Imported. 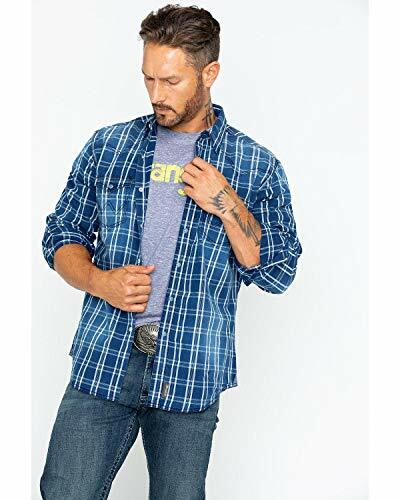 Wrangler Men's Big & Tall Retro Long Sleeve Snap Shirt. A long-time stylish staple, with its modern construction and slim fit, this Retro shirt truly never goes out of style. Great for a night out on the town or out to a concert, this Retro style shirt keeps you looking your best. FEATURES Modern Slim Fit. Tailored, yet comfortable fit through the torso and arms. Retro Style. Variety of Retro finishes - a vintage look for the modern man. Storage. (2) snap closure chest pockets. Durable. Built with 100% cotton or cotton blend. This Scully long sleeve shirt is for the man that likes to make a statement when he goes out. 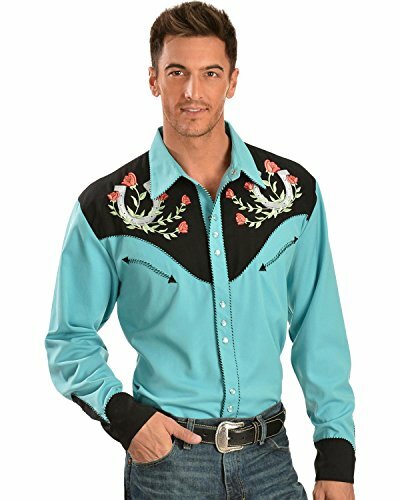 Whether you're two-stepping in a honky-tonk or simply having a drink at the bar, you will attract the right kind of attention in this striking black and turquoise Scully shirt with retro designs, pockets and buttons. 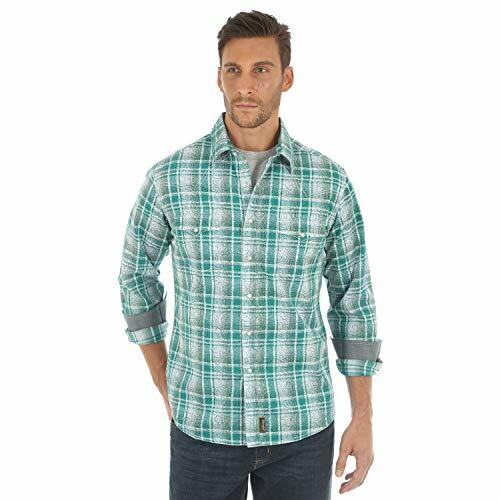 The versatile Wrangler® Retro Long Sleeve Snap Plaid shirt offers a versatile style that can be worn alone or with your favorite t-shirt for a more casual look. Regular fit is a tailored cut that is shaped to skim the body and allows full range of motion. Lightweight plaid fabrication lends superior breathability for all-day comfort. Spread collar. Snap-button front closure. Authentic Western back yoke. Contrast stitching for added detail. Long sleeves with chambray lining. Cuffs with two button-snap closures. Snap-flap chest pockets. Shirttail hemline. 100% cotton. Machine wash, tumble dry. Imported. Measurements: Length: 33 in Chest Measurement: 21 1⁄2 in Sleeve Length: 25 in Product measurements were taken using size MD. Please note that measurements may vary by size. 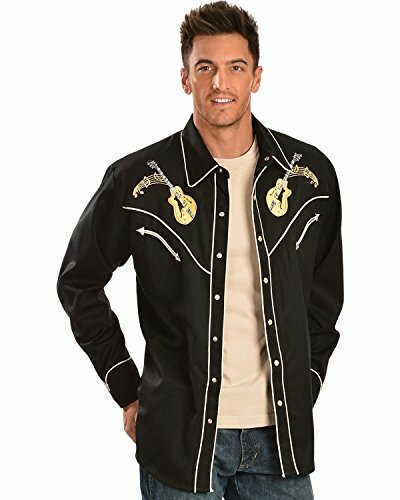 True western design complements every cowboy This floral embroidered Scully shirt features handsome embroidery at yokes and cuffs. Shirt boasts an easy-wearing spread collar. Two retro western style smile pockets complete with piping and arrow detail. Blue pearlized snaps at front placket and six-snap cuffs. 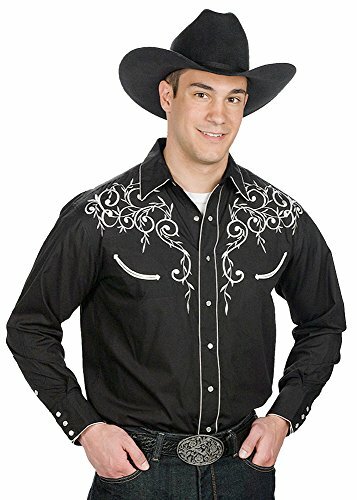 Western shirt is made of 65% polyester/35% rayon. Imported.